Impressive in the Oxford Revue's show at the Edinburgh Fringe Festival in 1977, Atkinson honed his comedic talents on stage before appearing on TV in 1979's Rowan Atkinson Presents... Canned Laughter (ITV). Six months later he achieved major fame as one of the talented team of comedy performers in the BBC 's satirical sketch show Not the Nine O'Clock News (1979-82). In the 1980s, he found a winning formula in the sitcom Blackadder (BBC, 1983-89), in which successive series followed different generations of the Blackadder family from the 15th century to the trenches in WWI. 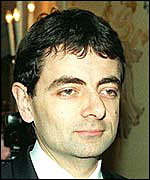 In the 1990s, he earned more success as the gormless, face-pulling Mr Bean (ITV, 1993), which became an international hit and led to the feature Bean (1997), directed by Atkinson 's old colleague from Not the Nine O'Clock News , Mel Smith . The visual comedy of Mr. Bean contrasted sharply with the verbal gymnastics of Blackadder and demonstrated Atkinson 's mastery of both disciplines. He had less success with police sitcom The Thin Blue Line (BBC, 1995-96) but, in response to the huge popularity of the Bean movie, he appeared in another big-budget US movie, Johnny English (US/France/UK, d. Peter Howitt, 2003), playing a bumbling British spy, a character he had created some years earlier for a series of Barclaycard commercials.